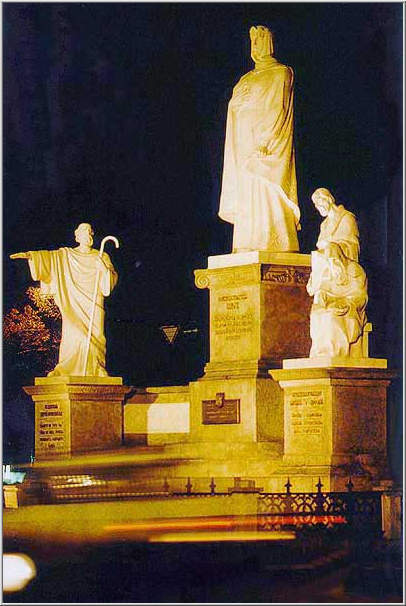 Monument to Cyrill, Methodius, St. Andrew and Princess Olga. Cyrill and Methodius (right) were two Greek monks who invented the Cyrillic alphabet and did a lot for illumination of ancient Kievan Rus. St.Andrew was also a famous illuminator of ancient Kievan Rus. The monument to Cyrill, Methodius, St. Andrew and Princess Olga (not visible here) was initially built in XIX century. In 1920s it was stolen by the communists and for a long time was considered to be lost. But in 1995 during the reconstruction of the Mykhailivska Ploshcha (square) it was discovered buried under the road. It was installed once again at the old place in 1995.